The funny thing about this recipe is that I don't even care much for scallops, or any shellfish for that matter. However, I felt we were due for another simple meal option. I had the sweetest comment back when I posted the Walnut Crusted Salmon and Edamame Mash from a reader named Mel (are you still out there Mel? Because I've been thinking of you.) who said that recipe was her go-to dinner for entertaining. So Mel, hopefully this is another idea for you, if of course, you are one for scallops. 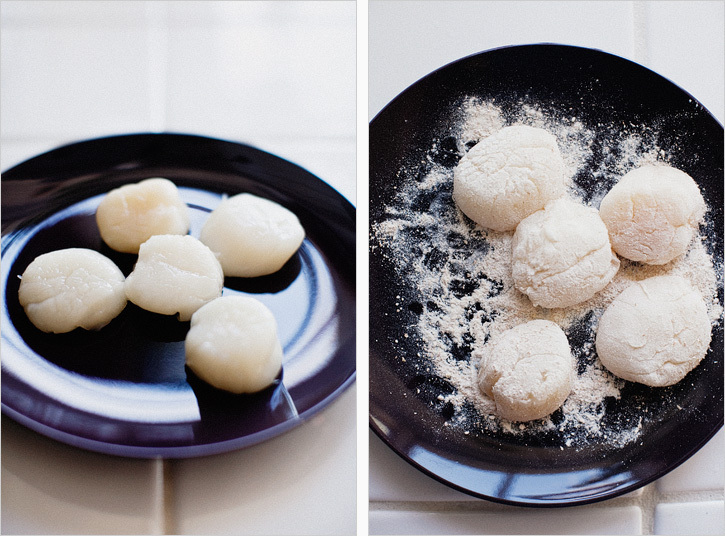 It is fairly quick, simple and tastes much more impressive than the effort it requires. I'm pretty certain that is an instant selling point right there. My suggestion would be to have all the ingredients for the scallop portion, cut and ready to go, because once you start searing the scallops, everything moves quickly. 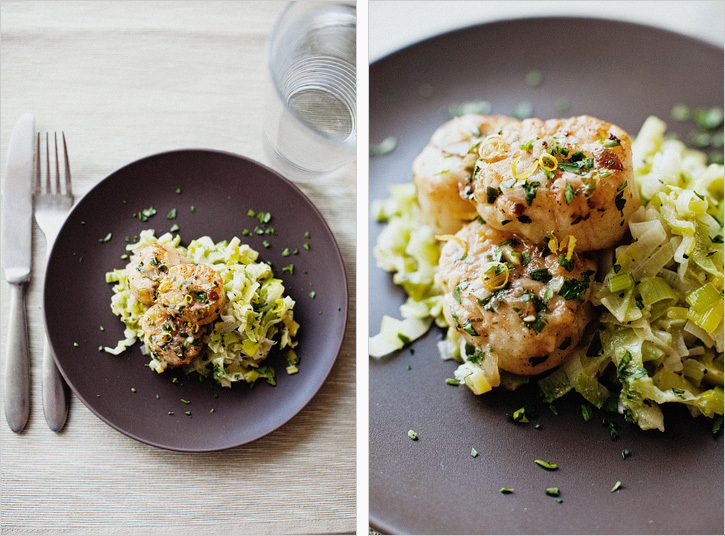 If you aren't a scallop person either, the leeks are worth your time. We're on the tail end of their season around here, and the two giant ones I found were just fabulous. 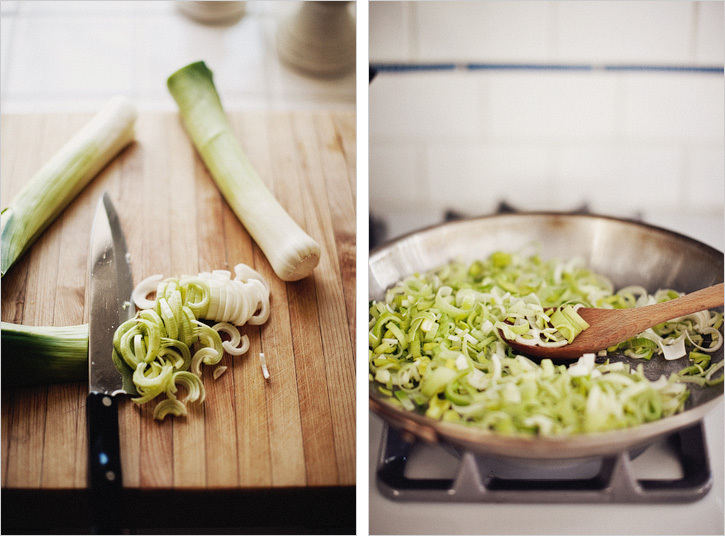 Leeks are one of those impressive vegetables where less fuss, is more. They reduce down to pillowy, subtle onion strings of caramelized wonderfulness. I generously shared the scallops we made, but the extra leeks got tucked away in secret tupperware for yours truly. It's hard to be exact with this, as the size of scallops you buy will vary the cooking time and amount of butter and wine you will need. For an entree, I suggest using larger scallops. If you can find a fish monger who sells fresh scallops, not frozen/thawed ones, the texture will be best. 1. In a large saute pan, heat the first 1 tbsp. butter until melted, add the leeks and salt, and stir around to coat. Add a tbsp. of water if the pan is looking really dry. Leave the heat on medium and continue to stir every few minutes to avoid any burning, for about 15 minutes. Prepare your scallop ingredients in the meantime. 2. Add the milk and pepper to the leeks, turn the heat to medium/low and continue to cook while you take care of your scallop business. As long as the heat is on low, you can't really overcook them here. 3. Pat the scallops dry with a paper towel and season with salt and pepper. Gently toss them around in the flour. 4. In another pan, let them brown on one side (about 2 minutes), gently flip to the other side and place them in a buttery part of the pan if possible (sear another 2 minutes). Add the shallot, dijon, wine and parsley and give the pan a few shakes to move things around and allow the temperature to come back up to a simmer (again, probably 2 minutes). Remove the scallops to a plate, use the spoon to scrape up the bits on the bottom of the pan and stir the sauce. Pour the sauce on top of the scallops. Squeeze the lemon juice on top. 5. To plate, put a big spoonful of the leeks and then the scallops on top with some of the shallot sauce goodness. 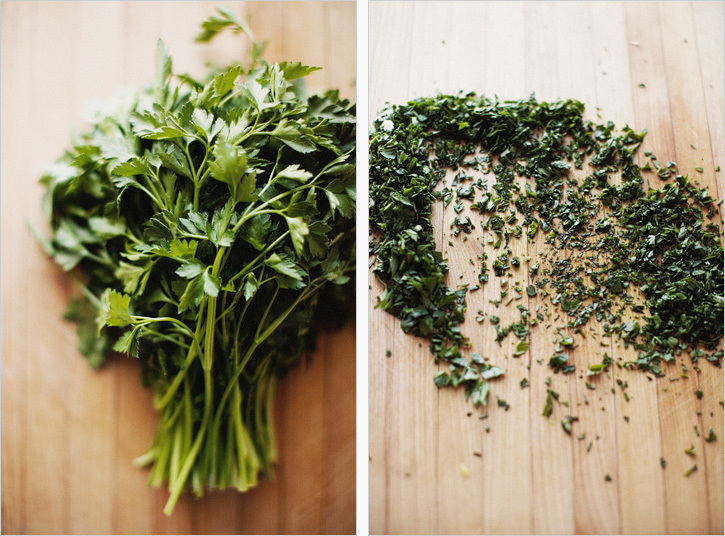 Garnish with the lemon zest, fresh ground pepper and fresh parsley.